Booster Buddy is a mobile app that aims to help teens and young adults improve their mental health through gamification of daily tasks. Based on different intervention strategies such as cognitive behavioral therapy, meditation, and mindfulness, the program uses a series of games and quests to teach coping skills, follow self-care routines, increase real-life socialization, and establish positive habits. When entering the program, the user selects their “booster buddy”- an animated figure which is the main character in the program. The program requires users to log in for daily jump-starts; these begin with a check-in of the user’s current state and then guide the user to complete 3 quests (e.g. take 3 slow deep breaths, think of 3 places in your city you would like to go) in order to wake the booster buddy up. Each quest marked as complete rewards the user with points they can redeem with accessories for the booster buddy. Adapting to the user’s emotional state, the difficulty level of the activities increases as the user reports feeling better. In addition to the daily jump-starts, Booster Buddy includes appointment and medication reminders; a crisis management plan; an extensive collection of coping skills; and a calendar to review accomplishments and well-being over time. Fun and simple app/ free. Lack of some engaging features. 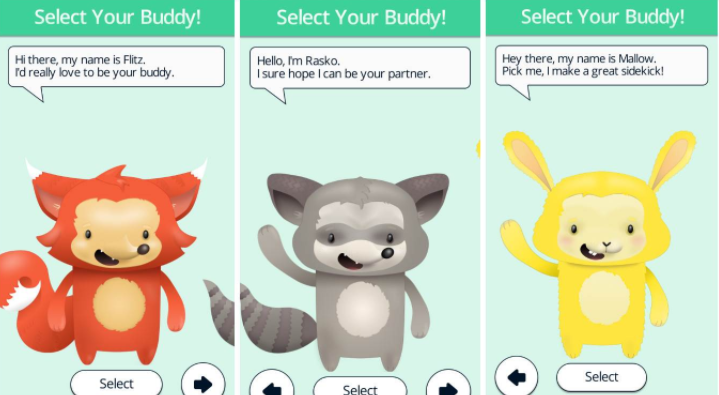 Booster Buddy is a fun and simple app most suitable as a supplement for ongoing treatment for teenagers struggling with mental health difficulties (including psychotic symptoms, depression, substance use, and anxiety). Booster Buddy is designed to be used as a daily check-in with small achievable assignments; however, given the difficulties it targets, this design makes the program less suitable as a standalone. Subsequently, the program attempts to refer users to seek professional help or support from others when needed. The “booster buddy” animated figure is cute and easy to relate to. The presence of this character creates a calming and friendly reach-out experience for the user. The information and the tasks are delivered in a non-judgmental manner – making the program friendly to use. On the downside, some aspects of user engagement (e.g., narration, videos, etc.) are missing from the mostly text-based information. As mentioned, Booster Buddy is best suited for teenagers. The app provides some features relating to ongoing treatment (e.g., medication reminders, a crisis management plan, etc. ), which makes it suitable as an adjunct to treatment. The therapist can integrate in-session reviews of activities conducted through the app, analyze its mood tracker, and assist in the initial set-up of the “crisis plan”.